Plus, Sergio Aguero could leave Man City in January. 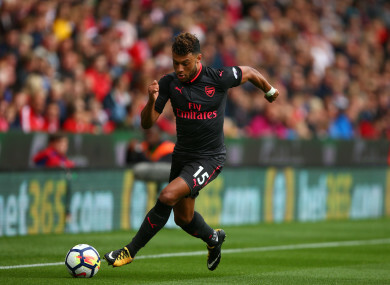 Liverpool are considering Arsenal’s Alex Oxlade-Chamberlain as an alternative to Monaco’s Thomas Lemar. Sergio Aguero could leave Man City in January if they sign Alexis Sanchez from Arsenal. Fulham have reportedly bid £15 million for Newcastle attacker Dwight Gayle. Inter Milan have made a £35m move for Arsenal defender Shkodran Mustafi. Stoke are preparing a £12m offer for Man City’s Fabian Delph. Virgil van Dijk is still hopeful of sealing a move to Liverpool, while the out-of-favour Southampton defender is also wanted by Chelsea and Arsenal. Barcelona midfielder Denis Suarez could join Serie A side Napoli before the deadline passes. Stoke’s Giannelli Imbula is set to move to Toulouse on loan, having failed to make the desired impact since joining the Premier League club in the last transfer window. Arguably the best player in the world at the time, Luis Figo made one of the most controversial transfers in football history when he joined Real Madrid from Barcelona in July 2000 for a then-world record fee of £37.2 million. Reviled ever since by Barca fans, Figo went on to have a successful stint at Real, making over 100 appearances and winning numerous trophies including the 2002 Champions League while there. He subsequently joined Inter, winning four Serie A titles in Milan before announcing his retirement in 2009. Email “Liverpool eye Oxlade-Chamberlain, Van Dijk latest and all today's transfer gossip”. Feedback on “Liverpool eye Oxlade-Chamberlain, Van Dijk latest and all today's transfer gossip”.